The young man's Torah reading will be flawless . . . his discourse will be stimulating . . . his poise will be captivating . . . years of study and preparation culminate with an affair where family members reap the nachat they richly deserve . . . the celebration will be tastefully orchestrated, as thirteen years of growth and learning climax on the day of the bar mitzvah. 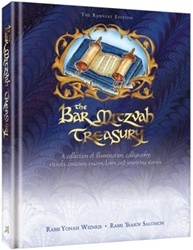 ArtScroll is proud to offer you this magnificent new volume, to experience and learn about the customs, traditions, laws and history of this frequently celebrated, but seldom understood milestone in Judaism. The breathtaking illumination and calligraphy of renowned Judaica artist Rabbi Yonah Weinrib and his collaboration on the fascinating details of bar mitzvah with well-known author Rabbi Yaakov Salomon, make it a beautiful gift, a cherished keepsake for celebrants and their families. 8 Â½ x11 gift edition, 186 pages, full color illumination throughout, and ribbon marker.